In the past ten years (2006-2015) an average of 11 road deaths per year in the Netherlands was registered in crashes involving agricultural vehicles. Compared to the early 1990s, the average number of road deaths due to crashes involving an agricultural vehicle increased from 1% to 2% of the total number of road deaths in the Netherlands. Agricultural vehicles are defined as agricultural and forestry tractors as well as self-propelled machinery used in farming, construction industry, civil engineering and the maintenance of public green spaces. Because it is not clear how many agricultural vehicles use public roads in the Netherlands and to what extent this is done, it is not possible to make any statements about the risk (deaths per vehicle or per distance travelled) of agricultural vehicles. Most of the casualties in crashes with an agricultural vehicle are cyclists and occupants of vans and passenger cars. According to the Sustainable Safety principle of homogeneity, agricultural vehicles should not drive on distributor roads because of their low speed. However, because of their mass and crash-unfriendly properties they should neither mix with cyclists and (light) moped riders. Due to the continuing scale increase in agriculture, companies possess an increasing number of agricultural lots spread over a larger area, thus making it necessary for their agricultural vehicles to travel greater distances on the public road. Currently there are several initiatives concerning access to land and agricultural logistics routes to limit agricultural vehicles mixing with other traffic. As yet, the effects of the mandatory T-licence for drivers of agricultural vehicles that was introduced in 2015 are unknown. A new measure that is frequently mentioned is the introduction of vehicle registration and licencing for agricultural vehicles. As a result, enforcement ‘on license plate ' will be possible and the control of technical requirements is made simpler, which could benefit safety. As it is not known to what extent the technical condition of agricultural vehicles or the traffic violations by their drivers lead to (additional) safety hazards, the effects of improved enforcement and control of technical requirements cannot be predicted in advance. What is the definition of agricultural vehicles? In the Netherlands, agricultural vehicles include both agricultural and forestry tractors, (hereafter called tractors), and self-propelled machinery used in farming, construction industry, development, civil engineering and the maintenance of public green spaces and gardens. Tractors are mainly used in rural areas, but also in urban areas as since 1995 tractors are permitted to use public roads for purposes other than agriculture. The group of self-propelled machinery – with the exception of trucks such as crane trucks – is included in the vehicle category ‘motor vehicle with limited speed’. See also under Which rules apply for agricultural vehicles? How many agricultural vehicles are there in the Netherlands and to what extent do they use public roads? Because agricultural vehicles are nor registered and licenced , their share in the vehicle fleet in the Netherlands is not precisely known. Depending on the source that is used, estimates range between 1% and 4% of the total fleet. Estimates by CUMELA[i]  result in 220,000 vehicles (200,000 tractors and 20,000 self-propelled machinery/motor vehicles with limited speed). The Dutch Safety Board  estimate is 97,000 vehicles (85,000 and 12,000 respectively). A more recent estimate by the Netherlands Vehicle Authority RDW  results in 400,000 vehicles (270,000 tractors and 130,000 motor vehicles with limited speed). The number of kilometres travelled by agricultural vehicles on public roads is also unknown. In its mobility surveys OVG/MON/OViN[ii] , Statistics Netherlands does not include information about the traffic performance of agricultural vehicles or about the number of vehicles. It is known, however, that the continued scale increase in agriculture   leads to farms with more agricultural lots scattered over a larger area, causing 'internal' agricultural traffic to use the public road more than they did earlier . [i] Trade association for companies involved in agricultural engineering works and earth moving, fertilizer distribution and agricultural contract work. [ii] National Traffic Survey (1985-2003), Netherlands Mobility Survey (2003-2010), Kilometres travelled in the Netherlands (since 2010). How many casualties are there annually in crashes involving agricultural vehicles? During the last ten years (2006-2015), the annual average in the Netherlands has been 11 registered road deaths in crashes involving agricultural vehicles. This number fluctuates considerably (see Table 1). Compared to the early 1990s, the average number of road deaths in crashes with an agricultural vehicle has increased from 1% to 2% of the total number of road deaths. An exploratory analysis of 45 police registration forms of fatal crashes in the period 2005-2009 in which, according to the registration form, an ‘agricultural vehicle' was involved, shows that in about 80% of the cases the agricultural vehicles were tractors and in 20% of cases they were motor vehicles with limited speed, especially self-propelled machinery such as shovels, excavators and sweepers. The number of serious road injuries in crashes involving agricultural vehicles is not known for recent years. Since 2009, when there were 46 serious road injuries, their number could no longer be reliably determined (see also SWOV Fact sheet Serous road injuries in the Netherlands). For the period 1987-2015, Jaarsma  gives a comprehensive overview of the registered road crashes involving casualties (deaths, hospitalized serious road injuries and slightly injured; source: Rijkswaterstaat-DID), with special emphasis on developments in the last seven years. It should however be noted that after 2009 the registration rate of hospitalized injuries has become so low that SWOV is of the opinion that reliable statements can no longer be made about these casualties. The registration rate of the slightly injured has always been too low for reliable observations . [i] The Maximum Abbreviated Injury Score (MAIS) is an international standard for injury severity. The injury severity of a serious road injury is MAIS 2 or higher. Which road users are casualties in crashes with an agricultural vehicle? Casualties in crashes with an agricultural vehicle are largely among the crash opponent. Most casualties are cyclists and occupants of vans and passenger cars (see Table 2). The share of cyclists is highest among the road deaths (32% of the fatalities in the period 2010-2015 were cyclists). During the period 2005-2009[i], occupants of vans and passenger cars among the serious road injuries formed the highest share (35%). The share of drivers and possible passengers of the agricultural vehicle is much lower (10% of deaths during the period 2010-2015 and 13% of the serious road injuries during the period 2005-2009). Table 2. Registered numbers of road deaths and serious road injuries (MAIS 2+) in the periods 2005-2009 and 2010-2015[i], in crashes involving an agricultural vehicle. Sources: IenM; SWOV (based on LMR - DHD and BRON - IenM) . [NB=unknown]. During the period 2010-2015, the drivers of the agricultural vehicles involved in a fatal crash are all male. About 11% of them are younger than 18 years old, ca. 18% are between 18 and 24 years old and 70% is older than 24 years of age (see Figure 1). In this period no females drove an agricultural vehicle involved in a fatal crash. 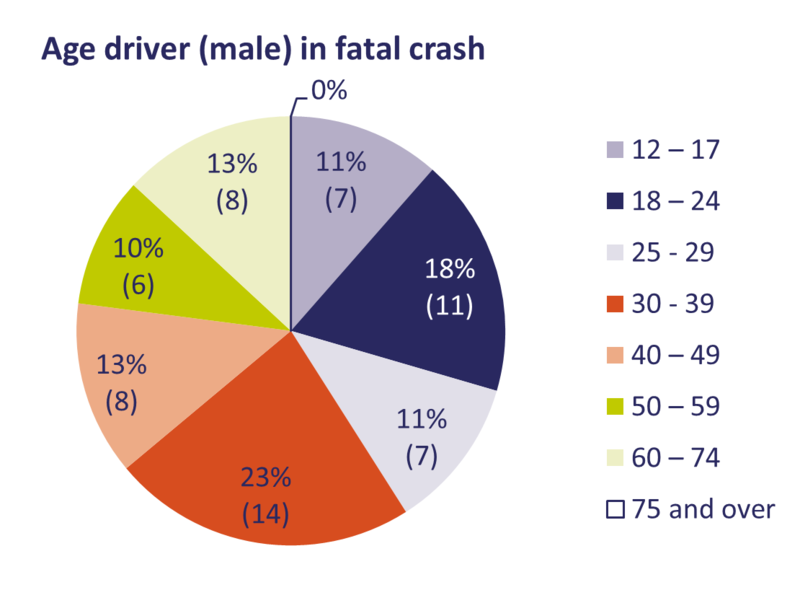 Because the distance travelled by male or female drivers in these age groups is unknown, we cannot determine whether specific groups of drivers have a higher risk. Figure 1. Age distribution of a total of 61 drivers of agricultural vehicles involved in fatal crashes, registered in the period 2010-2015. In this period no women were registered as driver of an agricultural vehicle involved in a fatal crash (source: IenM). [i] The number of serious road injuries in the period 2010-2015 is unknown, because since 2009 the number of casualties by mode of transport cannot reliably be determined. Where do crashes involving agricultural vehicles occur? The vast majority of fatal crashes involving agricultural vehicles happen on rural 80 and 60 km/h-roads. In the period 2010-2015, 68% of the fatal crashes involving an agricultural vehicle occurred on these roads (see Figure 2). No reliable data is available about the location of non-fatal crashes. Figure 2. 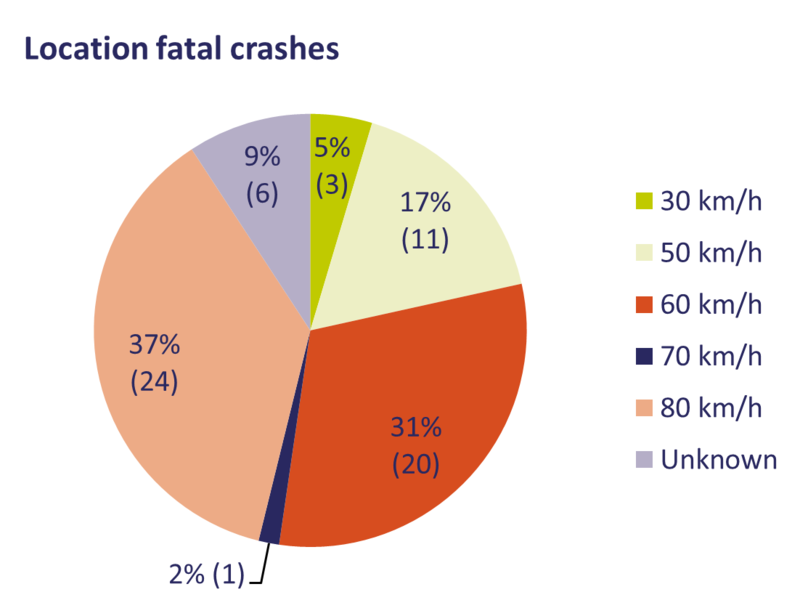 Speed limit at the location of a total of 65 fatal crashes in the period 2010-2015, as registered by the police (source: IenM). What are the major causes of crashes involving agricultural vehicles? In 2010, the Dutch Safety Board  found that the width of the agricultural vehicle in combination with often narrow roads is a major crash cause, as well as the fact that the driver’s view is often blocked by parts of the vehicle, machinery or cargo. In addition, the Dutch Safety Board concludes that the visibility and recognisability of agricultural vehicles in the dark can be a problem. These conclusions are based on an in-depth study of 11 serious crashes (with serious road injury or fatality) and the study of 73 police reports of fatal crashes with agricultural vehicles . How fast do agricultural vehicles drive? The legal maximum speed of agricultural vehicles in the Netherlands is 25 km/h, but especially tractors often drive (much) faster . Research by Rijkswaterstaat  found that only 11% of the surveyed drivers of a tractor with trailer indicated that they mostly drive slower than the limit of 25 km/h, 64% said they mostly drive between 25 and 40 km/h and 25% said that hey drive 40 km/h or faster. As agricultural vehicles are not subject to registration and have no licence plate, it is not possible to use automated speed enforcement (see also under the question What effect is to be expected from licencing agricultural vehicles?). Late 2016, Dutch parliament adopted a motion to increase the maximum speed of agricultural vehicles to 40 km/h . Which rules apply for agricultural vehicles? There are various legal rules that apply for agricultural vehicles. These can be subdivided into 1) rules for the agricultural vehicle itself, 2) rules for the place on the road and 3) rules for the driver. The Vehicle regulations (part of the Road Traffic Act 1994; in Dutch) regulate the maximum load and dimensions of tractors, trailers and motor vehicles with limited speed. Any sharp parts that can cause injury to road users, must be screened off before entering the public road. The road authority may grant exemption[i] for different dimensions. According to the Labour Conditions Act (in Dutch) mobile work equipment on which persons travel (e.g. tractors and self-propelled machinery), must have facilities that limit the dangers for these persons during the ride as much as possible. This can be done by means of a roll-over protection structure or a cage construction. From 1 January 2016, a new European legal type-approval system for agricultural vehicles applies (EU Regulation 167/2013). Among others, this regulation harmonises the type-approval for tractors in the EU, so that an approval for a specific type of tractor in one country is also valid in all the other EU member states. 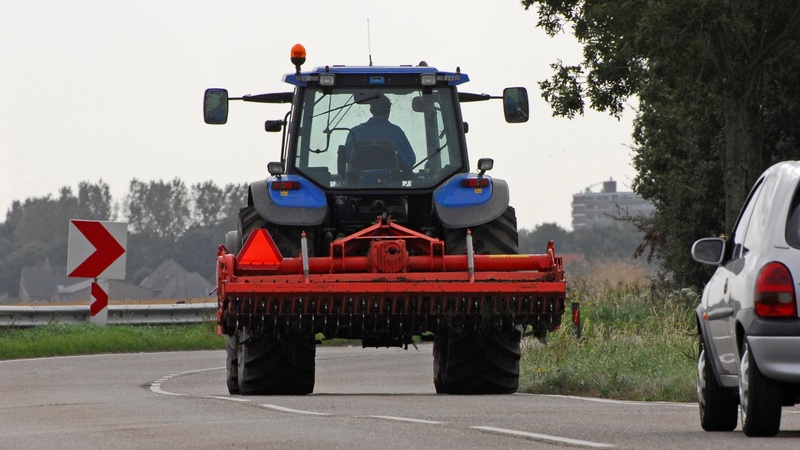 Like other vehicles, agricultural vehicles must be equipped with dipped-beam headlamps (front), city lights (on fenders), indicators, tail lights, brake lights and a left outside mirror (Vehicle Regulations; in Dutch). In addition, they must have two or four non-triangular red retro-reflectors at the rear. They must carry a yellow flashing or blinking light if they are wider than 2.60 m or when they perform work on or alongside the public road (Scheme Optical and Sound Signals 2009; in Dutch). Characteristic of a tractor is the red retro-reflector in the form of a truncated triangle at the rear. The Dutch Safety Board concludes that despite these lighting requirements the visibility and recognisability of agricultural vehicles can be a problem in the dark . Figure 3. Tractor with tool (harrow), flashing light and at the rear left the retro-reflecting triangle (photo: H. Dijkema). In the Netherlands, the legal maximum speed for agricultural vehicles is 25 km/h, but tractors can often drive (much) faster. See also the question How fast do agricultural vehicles drive? There are also requirements for the braking power of agricultural vehicles. For a maximum construction speed of 30 km/h, the braking deceleration should at least be 2.4 m/s2. For a construction speed from 30 to 40 km/h this should be 3.1 m/s2 and for higher construction speeds this should at least be 4.5 m/s2. This means that the allowed stopping distance (reaction + braking distance) of a tractor is approximately 15 m at a speed of 25 km/h and approximately 30 m at a speed of 40 km/h. Therefore the maximum stopping distance of a tractor is 30 to 50% longer than that of a passenger car. Although according to the Vehicle Regulations (in Dutch) the braking deceleration of the trailer must be the same as that of the tractor, the actual braking distance of the combination may in fact be considerably longer. Legally, agricultural vehicles are allowed to drive on all roads with the exception of trunk roads, motorways and roads that are closed to slow traffic in general or for agricultural vehicles and motor vehicles with limited speed in particular (traffic signs C9 and C8 respectively). The driver must be at least 16 years old and (since 1 July 2015) have the T-licence to drive a tractor or a motor vehicle with limited speed on public roads in the Netherlands. Drivers who already had a B-licence on 1 July 2015 are not required to have a separate T-licence. The T-category is automatically added when they have to renew their licence. No licence duty applies for drivers of motor vehicles with limited speed narrower than 1.30 m that are used for mowing, weed control, sweeping, snow removal, prevention of slipperiness, or dog poo collecting and that cannot pull a trailer or interchangeable machine. In EU countries the minimum requirement for driving an agricultural vehicle in is a B-licence or a T-licence. Before the introduction of the T-license, a ‘certificate of professional competence’ was sufficient if the driver was 16 or 17 years old and worked with a tractor on the public road as an employee. Before 1 July 2016, holders of the certificate of professional competence could exchange this document for a T-licence. See also the question What is the road safety effect of the T-licence? What is the safest place on the road for agricultural vehicles? Research from the 1980s shows that it is safer to let agricultural traffic use the service road along with cyclists than to let agricultural traffic use the main road along with the high-speed traffic . This is in line with the Sustainable Safety principle to avoid large speed differences. Therefore agricultural traffic is preferably not allowed on distributor roads. However, if no suitable route via a service lane or another access road is available, this could result in an accessibility problem. For example, service roads may not be present due to high construction costs, insufficient space or very little traffic. In those cases, road authorities do allow agricultural vehicles on distributor roads and offer motorized traffic the possibility to overtake these vehicles using the lane for oncoming traffic. It must be noted that agricultural vehicles on service roads also has disadvantages for road safety if they need to mix with bicycle traffic. Because agricultural vehicles often exceed their maximum speed of 25 km/h (see also the question How fast do agricultural vehicles drive?) this results in speed differences and significant differences in mass. In addition, the size and crash aggressiveness of agricultural vehicles play a role. From the bicycle safety point of view it is therefore better to separate agricultural traffic and cyclists . This is why some road authorities construct both a service road and a bicycle path or let agricultural traffic use the main road. Which roads are to be used by agricultural vehicles is also a problem in urban areas. They are regularly banned from the routes that bypass the town centre, with the result that agricultural vehicles need to use the road that go through the town centre . Because of their size, shielding and field of vision, this is not a desirable location for agricultural vehicles. The only roads in built-up areas that are suitable for agricultural vehicles are distributor roads that have the separate bicycle paths, crossing facilities and speed-reducing measures at intersections that are required according to Sustainable Safety. What is the road safety effect of the T-licence? Since 1 July 2015, drivers of tractors and motor vehicles with limited speed on the public road must have a T-licence. Although the Dutch Safety Board  expects that the T-licence will have a positive road safety effect, no evidence is known. Further investigation is required to establish the effects. At the introduction of the T-license, the Ministry of Infrastructure and the Environment has given their undertaking to evaluate the effects . Before the introduction of the T-license, a ‘certificate of professional competence’ was sufficient if one was 16 or 17 years old and worked with a tractor on the public road as an employee. This was not a driving licence within the context of the Road Traffic Act, even though it was often referred to as the ‘tractor driving licence for youths’. The requirements for this certificate mainly focused on vehicle control and they were minor compared with the driving test for car, motorcycle, truck and the current T-licence. The exam for the T-licence consists of a theoretical and a practical part and is held by CBR, the organisation in the Netherlands that administers basic driving tests as well as advanced tests for experienced drivers. The theory test can be passed from 15.5 years old and the candidate may take practical lessons from 16 years of age. The practical test is taken and must be passed on the public road in a tractor with trailer. Various driving schools and schools for agricultural education offer theory lessons and practical lessons. Following recommendations of the Dutch Safety Board  requirements concerning safe traffic behaviour have been included in the official requirements for the T-licence , in addition to requirements concerning vehicle control. This means that the candidate must show during the ride a) to take account of the interests of other road users and the road environment, b) to anticipate traffic developments and c) to engage in positive communication with other road users. 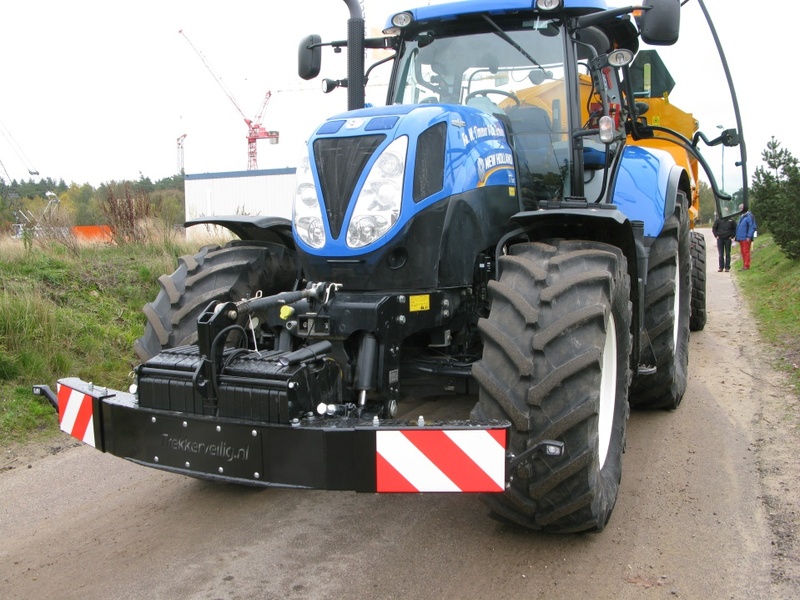 What is the effect of a tractor bumper on the safety of agricultural vehicles? A so-called tractor bumper is a shielding device on the front of the tractor (see Figure 4). This bumper is mainly intended to limit the consequences of a collision with a car. Tractor bumpers are not mandatory, but are sometimes fitted on the initiative of the sector. Some customers, for example, demand that tractors and trailers are equipped with shielding facilities at the front, side and back. The Dutch Safety Board  has found that the crash aggressiveness of agricultural vehicles plays a role in occurrence of the crash and/or the severity of the outcome. In addition to the relatively large mass this is due to the shape of an agricultural vehicle. This is – other than the shape of a truck – not tuned to a possible collision with other types of vehicles, cyclists or pedestrians. Shielding facilities are expected to have a positive safety effect, but this has not yet been evaluated. Figure 4. Example of a tractor bumper (photo: SWOV). Which effects are to be expected when vehicle registration and licensing is introduced for agricultural vehicles? Currently, agricultural vehicles are not registered and licensed. Licensing is often suggested for various reasons (e.g. by the Dutch Safety Board), among other things because it would make it possible to enforce ‘on licence plate’ and control of possible technical approval would be made easier. Both are expected to have a positive safety effect . Early 2013, Dutch Parliament adopted the ‘Kuiken motion’  which called for licensing agricultural vehicles. The legislative proposal of the Minister of Infrastructure and the Environment (IenM) to make this possible, and at the same time increase the speed limit for agricultural vehicles from 25 km/h to 40 km/h, was widely carried by the relevant parties,[i], but was still rejected in Parliament on 13 December 2016. However, a motion to increase the maximum speed to 40 km/h was adopted . On 1 June 2017, the Minister of Infrastructure and the Environment once more presented a proposal for the introduction of licensing . She considers this the only solution to comply with the EU legislation of an MOT for tractors with a maximum construction speed of more than 40 km/h and as a precondition for a possible increase of the speed limit to 40 km/h. As it is unknown to what extent the technical condition of the agricultural vehicles or traffic violations by drivers of agricultural vehicles lead to (additional) unsafety, it is impossible to make an accurate estimate of the effects of improved enforcement and control of technical requirements in advance. [i] Including important interest groups from agricultural and transport sector such as: LTO, the Dutch Federation of Agriculture and Horticulture, CUMELA Nederland, branch association for entrepreneurs in green, ground and infrastructure, RAI, Association representing the interests of manufacturers and importers of cars, trucks, trailers and semitrailers, car bodies and special vehicles, motorcycles and scooters, (light) mopeds, and bicycles, EVO, association for entrepreneurs in logistics and transport, and TLN, the Dutch Association for Transport and Logistics. What (other) measures could help prevent crashes with agricultural vehicles? Measures to prevent crashes involving agricultural vehicles, are targeted at 1) the vehicle, 2) the road and the place on the road occupied by agricultural vehicles, and 3) the driver. Below the measures in the first two categories are discussed. The measure aimed at the driver – the introduction of the T-license – is discussed under the question What is the road safety effect of the T-licence? . Because we have only limited insight into the causes of crashes involving agricultural vehicles, it is difficult to estimate the exact effects of the various measures. Legal requirements for all types of agricultural vehicles and a (periodic) inspection should contribute to improved vehicle safety: the Dutch Safety Board made this recommendation in 2010 . There are already European requirements for tractors that participate in traffic on a certain date or will participate after that date. Because these vehicles are not registered and licensed in the Netherlands, monitoring is not possible. Safety features for agricultural vehicles are not always easy to achieve. Agricultural vehicles are primarily designed for use on farms and in fields. According to the Vehicle Regulations (in Dutch) any sharp parts that could cause injury to road users, must be screened off before entering the public road. Where additional measures have been taken or developed, this was mainly done on the initiative of the sector. For example, NAM, whose core business is exploring for and producing oil and gas in the Netherlands, demands in contracts with their subcontractors that tractors (and trailers) are equipped with shielding facilities for the front, side and back. The so-called tractor bumper (shielding device at the front) is mainly intended to limit the consequences of crashes with a car. NAM also makes demands concerning maintenance, lighting, retroreflective side and contour marking, and age and experience of the driver. Behl et al. argue that especially equipping agricultural vehicles with a Lane Change Assistant (LCA)[i] has a high safety potential: a 21% reduction in serious casualties. According to these researchers the potential effect of measures that improve the visibility of agricultural vehicle and trailer (retroreflective marking at the rear, anti-glare headlights, clear taillights, contour lighting, etc.) would be a 17% reduction in serious casualties, and that of front and side under-run protection for trailers would be a 7% reduction . The most appropriate place on the road for agricultural vehicles is not easy to determine, with regard to the Sustainable Safety-principle of homogeneity of speed ánd of mass (see also the question What is the safest place on the road for agricultural vehicles? and SWOV fact sheet Sustainable Safety). conclude that increase of plot size by reallocation of land reduces the agricultural traffic on public roads. In Advancing Sustainable Safety, Wegman & Aarts  advocate the use of dedicated lanes for trucks as a solution for the issue of freight traffic. Similarly it can be reasoned that in the long run agricultural vehicles do not belong on the public road at all, but should be on a special vehicle lane. An example of this is in the municipality of Tholen in the Province of Zeeland where in 2012 an agricultural path was introduced that leads agricultural traffic around the village centre  . In the short term, road section-related measures can also contribute to improved safety of agricultural traffic in addition to these structural, area-specific solutions. On roads where agricultural traffic mixes with cyclists and pedestrians it is important to reduce speeds on road sections (but at intersections as well). According to the homogeneity principle is not advisable to allow agricultural vehicles on distributor roads (with a speed limit of 80 km/h) in view of the speed difference with the ordinary motorised traffic. On these routes a service road would be more appropriate. However, given the speed difference as well as the differences in mass and structure between agricultural vehicles and cyclists it is equally inadvisable to allow these two modes of transport to mix on service roads . A possibility to prevent this is the construction of a bicycle path in two directions at one side of the main road and a service road in two directions for agricultural vehicles at the other side. Another option is to allow agricultural vehicles on distributor roads – possibly with a higher permitted speed plus making higher demands on vehicle and driver. According to Advancing Sustainable Safety a road with a speed limit higher than 70 km/h should have direction separation that is hard or impossible to cross. It is important that at such roads so-called ‘passing places' are constructed or that there is the opportunity, for example, before or after intersections, to overtake agricultural vehicles. Such an option can reduce the delay for other traffic and therefore presumably also reduce irritations  . Finally, the Dutch Safety Board suggests the construction of left-turn lanes in accordance with the Handboek Wegontwerp  (Manual Road Design) as a measure to prevent lateral and rear-end collisions on distributor roads . Furthermore, Behl et al. mention improving the view from yard or field as a measure to prevent lateral conflicts when the agricultural vehicle enters the road (approximately 5% reduction in serious casualties). [i] Lane Change Assistent (LCA) helps the rider to change lanes safely. The system monitors the space next to the vehicle including the blind spot. When the driver has activated the direction indicator, the LCA gives feedback (usually through an acoustic and visual signal) on whether the adjacent lane may or may not be free.
. SWOV (2016). Data sources; Comprehensive overview. SWOV, The Hague. SWOV (2017). Agricultural traffic. SWOV Fact sheet, June 2017. SWOV, The Hague.